Locked behind the Doors of Dinh for 1,000 years, the Wintertodt has worn away at their strength. With the doors weakened, the Order of the Sacred Flame must prevent the incorporeal cold from sweeping over Great Kourend. However, the Order's resources are limited. They need all the help they can get. To help in the fight against the Wintertodt, head north of Great Kourend or use the games necklace and talk to Ignisia. Once you have spoken to Ignisia and you make your way through the Doors of Dinh into the prison, you'll have to use your Agility, Crafting, Farming, Fletching, Firemaking, Herblore and Smithing to help the Order keep the Wintertodt weak. The Wintertodt has an affinity with the cold, so wrapping up warmly will help you ward off some damage from its attacks. Warning: The Wintertodt's prison is a dangerous area. If you die, your items will drop to the ground. The key tool at the disposal of those fighting against the Wintertodt is the bruma tree. The bruma tree is able to withstand the brutal chill of the Wintertodt, making it perfect for keeping the flames weakening the spirit lit. To aid the Order of the Sacred Flame, you can chop the bruma roots found in the prison and use them to keep the large braziers around the howling storm lit. You can also cut the logs down into kindling before using them on the braziers. The Pyromancers tasked with channeling the power of the flames towards the Wintertodt are constantly in the line of fire. Whether or not they're injured, they must stand by their post. 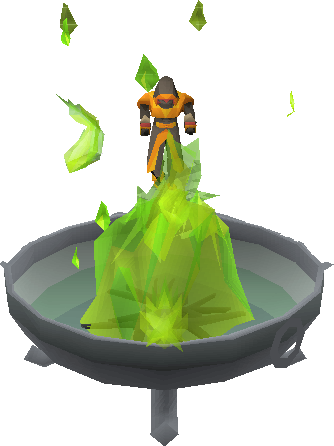 Help the Pyromancers keep the Wintertodt weak by creating rejuvination potions and using them to heal the mages. To create the potions, pick the bruma herbs sprouting from the walls of the prison and combine them with the concoction found in the supply crates by the entrance. Through your activities within the prison of the Wintertodt you will earn a fair amount of experience in the skills you are using. If you really give it your all, the city of Great Kourend may recognise your efforts and reward you further. Supply crates are received from the city of Great Kourend to recognise the work you've done to defend the city from the wintery wrath of the Wintertodt. These supply crates can provide you with some some valuable rewards, a number of which are new to Old School. When charged to any level the Tome of Fire is an infinite source of fire runes which can be equipped in the shield slot. The Tome of Fire also offers +8 Magic attack and Defence, as well as a 50% damage increase to elemental fire spells. It requires level 50 Magic to equip. To charge the Tome of Fire you must use burnt pages on it. These are also received in supply crates when participating in the fight against the Wintertodt. One burnt page gives the tome 20 charges. One charge is consumed whenever an elemental fire spell is cast with the tome equipped. When all charges are consumed the Tome of Fire will no longer act as an infinite source of fire runes. The Pyromancer outfit provides a small increase to the amount of Firemaking experience you receive for each piece you have equipped. We've also thrown in a pair of Pyromancer gloves, just to finish off the set. They do not contribute to the experience boosting effect of the set, they just look really cool. The bruma torch is an inextinguishable, equippable light source. The torch requires level 50 Firemaking to equip. Head north of Great Kourend to the icy prison and get involved! We've made a couple of small, but significant improvements to PvP combat in this update. Before today's update, if your opponent was on very low hitpoints when your damage is calculated, but they ate just before the damage was dealt, you would never hit high enough to kill them. This meant that if they were to eat at the correct time for each of your hits, they would never be able to take fatal damage. We have now fixed this in player-vs-player combat. Now, even if a player is on very low hitpoints when your damage is calculated, you will still be able to hit above that amount when the damage is dealt. We do not intend to change this for player-vs-monster combat. It is no longer possible to use the Lunar spell 'Energy transfer' in single combat PvP areas. Players will now receive a Bloody key if their opponent logs out. Lisa will now call out the number of players needed to start a competitive game. The spawn locations for loot crates have now been randomised. Only 48 players are needed to start a game now rather than 60. Prayer potions have been increased in price and rune packs have been lowered in price. The stepping stones to the island have been replaced by a path. This weekend we will be running the first ever high-stakes weekend for Last Man Standing. From Friday at 5pm BST until Monday 10am BST you will be able to participate in a 1m buy-in queue! This high-stakes queue will allow you to potentially win a 15,000,000 coin prize from a single game. Players can now claim free hoods for their skillcapes by talking to the skillcape seller. Charter ship stores now have a separate stock for each port. Players can now pay Lazim 1 million coins to upgrade a Camulet to have infinite charges. Teleporting with a Camulet will now tell you how many charges are left on it. An NPC who will crush items for a small fee has been added in Nardah. The TzHaar gem shop now has a separate stock for Ironmen. Ancient shards now have a larger click zone to make them easier to pick up. The emerald lens can now be swapped out from emerald lanterns by replacing it with a plain lens or a sapphire lens. Spice shakers will now appear above ashes when dropped so that they are easier to pick up. 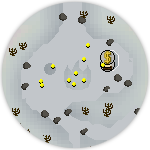 Botanical pies have been removed from the Master clue drop table. Other items now have a slightly higher chance of being obtained because of this. The barbarian rod will now appear above fish parts when dropped so that it is easier to pick up. Fixed a stretching issue with the Supreme Leader haircut on female characters. Fixed an issue where the Thermonuclear smoke devil would reappear briefly after dying. Fixed an issue where the right-click option on Temple Trekking NPCs would not work in some situations. Adjusted the statistics on some fun weapons to ensure that all fun weapons are consistent. Clarified the description of the Desert hard task for enabling Ancient Magicks. Fixed a spelling error in dialogue with Dunstan. fight perhaps to encourage brazier activity). Allowing rejuvenation potion use on others could inventivize more active (and rewarding) use of the potion. Revamp Games Room with things like staking in BlackJack (21) and give current high ranking players rainbowscape?